If you're renovating your kitchen and have a limited budget to work with, consider refacing your kitchen cabinets instead of replacing them. About one third of the cost of installing new kitchen cabinets, cabinet refacing has the appearance of an expensive kitchen renovation without the labor-intensive, costly hassle of tearing out and completely replacing your existing cabinets. It's a well-known fact that kitchens and bathrooms are the most valuable rooms in the home. When property values are on the decline, it makes a lot of sense to put your money in areas of the home that will give you the greatest return on your investment. Refacing your kitchen cabinets is not only more cost effective than replacing them, it also allows you to drastically improve the look of your kitchen more quickly than traditional replacement. Removing your existing kitchen cabinets is a major construction job that can render your kitchen unusable for weeks. Disposing of old cabinet materials and re-cutting all shelves and supports to hang new cabinets is time consuming as well as expensive. If you are planning to sell your home and want to put it on the market soon, kitchen cabinet refacing will help you give your kitchen a fresh, updated look in a fraction of the time it would take to completely replace your kitchen cabinets. 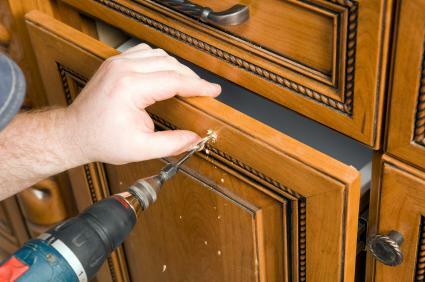 Professional cabinet refacing can usually be done in three to five days. Cleaning and polishing: Bring out the original beauty of your cabinets with a thorough cleaning using mild detergent and warm water. If you go with a commercial cleaner, test it first on a small area to make sure it won't harm the finish. Repainting and resurfacing: Carefully remove the cabinet doors, sand them down to the original wood, then repaint or stain the doors. If you decide to hire a professional, expect to spend $90-$100 per door. Rigid Thermofoil, veneers and laminates: Get bids on this option from at least three different contractors. Costs range between $60-$400 per door. This would be considered an advanced do-it-yourself project. Replacing the doors and hardware: Always match the design and color of the existing cabinet framework when replacing the doors. Costs range between one $125-$135 per linear foot. Purchase hardware such as knobs, hinges and drawer pulls to match in color and design as well. If you decide to go with the option of replacing your kitchen cabinet doors, you will need to decide what type of material you want for your new doors. Solid Wood: Solid wood cabinet doors are a good choice if you plan on remaining in your home for many years. Solid wood can be refinished multiple times, unlike veneers or laminates which must be replaced when damaged or outdated. Glass: Glass cabinet doors can be very classy. Purchase pre-formed door panels with openings for the glass already in place; a local glass company can cut and install the glass for you. Keep in mind that only the upper cabinets are appropriate for glass doors. Lower cabinet doors are subject to breakage and might look awkward with glass doors. Metal: Metal is one of the hottest new trends for kitchen cabinet doors. Options include stainless steel, copper or brass and you can choose finishes that are polished, matte, quilted or plain. Veneers: Veneer panels give you the look of real wood. Veneers are sold in 24-inch by 96-inch sheets; cut them to size and apply them over your existing cabinet doors with a special adhesive. Simple cabinet refacing projects that involve cleaning or repainting and resurfacing existing cabinet doors can be done without hiring a professional in the case of competent, do-it-yourself home renovators. However, consulting with a professional for this type of home improvement is usually recommended. There is a lot of information on the subject of refacing kitchen cabinets; thoroughly research and explore all available options before starting any major home improvement project to get the best results on your job.